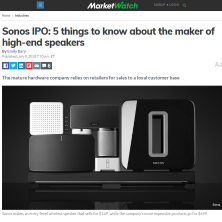 Sonos SONO, +0.00% makes high-end speakers, and the company has tried to capitalize on increased interest in voice commands by giving its products “smart” capabilities. Sonos currently sells products that are compatible with Amazon’s AMZN, +1.04% Alexa voice assistant, and Sonos expects its speakers to work with Alphabet Inc.’s GOOGL, +0.52% GOOG, +0.69% Google Assistant later this year. Adding Siri compatibility is a bit trickier, since Apple Inc. AAPL, +1.24% services don’t generally play nice with hardware made by other companies. Sonos plans to introduce Siri on its speakers later in 2018 through Airplay 2, a sort of back door that allows Apple devices to stream audio to other devices. Sonos also has its own voice controls. Investors looking for a pure play on the rise of voice assistants could get an opportunity in the coming months, as Sonos on Friday filed a prospectus with the Securities and Exchange Commission ahead of its expected initial public offering. The filing provided a look at Sonos’ finances, including more muted revenue growth compared with other recent IPOs as well as small net losses on an annual basis. Sonos intends to raise up to $100 million through its offering, according to the prospectus, but that is typically a placeholder amount that will be updated in future filings. Assuming completion of the IPO, shares will trade on the Nasdaq under the ticker SONO. Here are five things to know about Sonos and its plans to go public. Sonos has been around since 2002, and that means it’s in a different place financially than many younger tech companies. The company hasn’t raised outside money since 2014, according to FactSet, and it’s on pace to generate $1 billion in revenue for the fiscal year that ends this September. The company posted $992 million in revenue for its 2017 fiscal year, up from $901 million in 2016, making for a growth rate of 10%. Sonos recorded a $14 million net loss in 2017, compared with a $38 million net loss in 2016. For the first six months of Sonos’ 2018 fiscal year, which includes the holiday period, the company generated net income of $13 million. Sonos was profitable in the first half of its prior fiscal year as well. “They don’t need to show investors they have a path to profitability, but they do need an answer to the 800-pound gorilla,” said Phil Haslett, co-founder of EquityZen, an online marketplace for pre-IPO shares. That means Sonos will need to show how it plans to compete against devices from “diversified, cash-rich companies” like Amazon and Google.